Some ranchers feel strongly that the only way to work cattle is with horses. 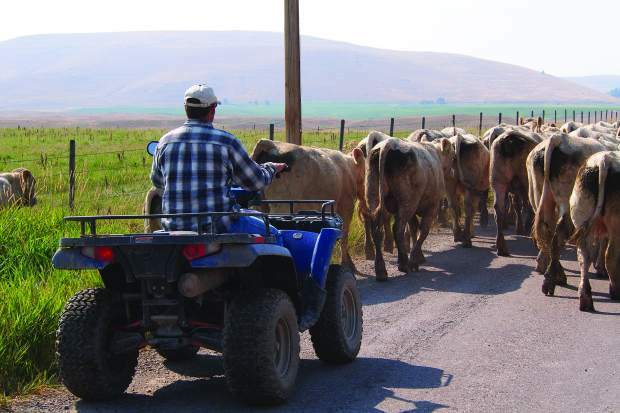 Other ranchers don't even own a horse and do all their cattle moving with 4-wheelers. Still others use both, and appreciate the advantages of each. Craig Bieber (Bieber Red Angus, Leola, SD) says there's a place for both. "Our ranch is not so rough that we can't use a 4-wheeler, but there are other areas where I can see that a horse would be the only way to gather or move cattle," he said. 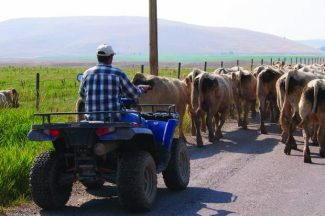 If a person uses low-stress handling tactics and the cattle are accustomed to horses and 4-wheelers, either method works well. "If the handlers are in tune with the cattle and what's going on, that's the most important thing. A person can be just as destructive (getting the cattle upset and excited) on a horse, if you don't know what you are doing," Bieber said. "The person moving the cattle needs to understand low-stress handling, always thinking ahead. You need to use good cattle-handling methods whether you are on a horse or an ATV," he said. Use good cow sense, giving cattle time to think about where you want them to go. Things only get wild and out of control when you don't give them time to move the right direction in response to gentle pressure. The amount of space and time you need to give them will vary, depending on the cattle. T.E "Buddy" Westphal, a Charolais breeder near Polson, MT, said that to work cattle properly it takes common sense as well as cow sense and horse sense. "The ability to work cattle quietly also means dollars and cents. It's best to open the path and let the cattle go through it than to chase them and risk injury to people and animals and run off valuable pounds," he said. Keeping cattle calm and quiet also makes it easier when they need to be sorted or doctored. "They're less apt to try to break and run to flee the pressure. It's nice if they will go calmly where they are pointed, whether by a horse or a machine," Westphal said. Safety issues vary. In some instances a person is safer on a horse because the horse is more agile than a 4-wheeler for getting out of the way if a cow charges or bulls are fighting and not paying attention to people. "You can also have a wreck on a horse," Bieber said. There are risks either way, depending on the situation and what you are doing with the cattle. "I feel we can work cattle with horses a lot quieter, but if there's a distance or time factor involved – such as traveling a long ways to the pasture where the cattle are – we can cover more ground with a 4-wheeler," Bieber contintued. "We often haul horses to a far pasture, but the 4-wheeler is handy if we want to grab the mineral feeder and move it, too." It's also easy to take fencing tools or materials on the 4-wheeler. 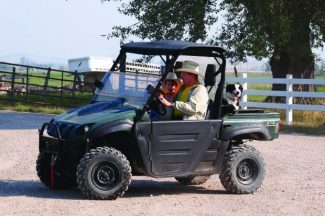 "We use dogs, and we can jump the dogs onto the back of the 4-wheeler and away we go – and it saves wear and tear on them. We can have the cattle moved, the mineral feeder moved, and the water tank and fence checked in half an hour, and have tools with us in case we need them. With a horse, this might be a full afternoon project. Depending on your operation, you may benefit from using both methods, choosing the tool that works best in a certain situation," Bieber said. One of Bieber's rancher friends said he'd never own a 4-wheeler, but a few years later he had one. "He wanted his employees to be able to cover more ground and do more things during a day than they could on horseback. We all need to be more efficient." Westphal also feels strongly about the importance of efficiency, and uses ATVs as well as horses. "I don't always admit to all my cowboy friends – when I'm at a team roping or cutting – that I use 4-wheelers. But I can go to a pasture and get the cattle moved on a 4-wheeler, with my dog's help, in the time it would take to catch and saddle my horse," he explains. 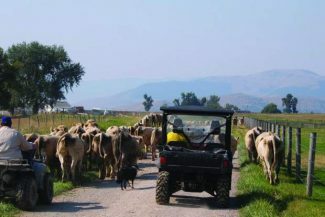 The ATVs are also helpful when taking a large group of cattle a long ways. Someone on a 4-wheeler can skoot ahead and open or shut gates, block driveways, etc. "When we're trailing 250 yearling bulls on a 15 mile drive to their summer pasture, they get strung out a long ways," Westphal added. "Some of the trip is on roads that need gates closed. A call on the radio or cell phone can have someone come from the back of the herd in just a minute." Part of the route is across sagebrush hills and deep draws. "On a 4-wheeler its easy to drive to the top of a hill to see what's needed from the front to the back of the herd and direct the helpers," he continued. Westphal suggests getting cattle accustomed to a 4-wheeler before you try to use it to herd them. "It takes an introduction period. Ease around the outskirts of the herd. Keep the pressure off. It helps to use a bale of hay on the front and back to bait them and get them comfortable with it. I recommend having the cattle in a small pen or pasture for their first introduction, so they can't go blasting off if they get scared." He drives through his cattle a lot during calving season and they are also accustomed to being moved from pasture to pasture when a person drives out to open a gate. "They get to know the 4-wheeler as a good sound, similar to a feed truck. It's easier to open a gate and let them go through than to chase them," he says. Westphal recently bought a Rhino (side by side) so his 2 preschool grandsons can go with him to move cattle. "My dog rides in the box in the back and I can also haul salt or fencing supplies. With the Rhino I can also close the doors and pop up the windshield to keep the rain – or this year keep out the dust!"